Photo: State House.President Sata at his inauguration (file photo). 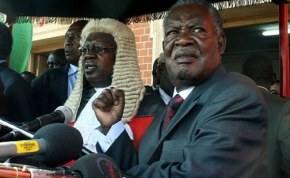 A Zambian court is examining a request to have doctors assess the health of Zambian President Michael Sata. There has been increasing speculation about the 77-year-old’s health and treatment he reportedly received in Israel. RFI spoke to Nevers Mumba, president of the opposition Movement for Multiparty Democracy party. What is going on with President Sata’s health? There doesn’t seem to be much official information from the government. Precisely, yes, we do have a situation. The government is not informing the people as to the state of the president. What is common knowledge in the country now, of course, is that the president is unwell because the last time we saw him on Labour Day, he was very frail, very sickly and the whole country was gripped with great concern and fear for his life. But after that we have not seen him in public again and we continue to receive contrasting statements from government which have brought tremendous anxiety in the nation. Zambians would like to know exactly, firstly, the state of the president and even his whereabouts. And so as opposition we feel that that the Zambian people are being deprived of information that is supposed to be given to them and we’re demanding that the state of the president be made known to the Zambian people. There have been various reports about his recent visit to Israel. Do you think this was to receive treatment or a working vacation as the information minister has stated? We have demanded through parliament that a statement be made by the government to give us details of the so-called working holiday in Israel. We are apprehensive that the visit was a working holiday because the information given to us was that he was supposed to meet with outgoing president Shimon Peres who was in Washington at the time that the president was there. Secondly, the media in Israel did allude to the fact that yes he was in hospital but he was not in dire condition, which confirms that he did not go for a working holiday but rather to the hospital. And this is why the Zambians have now demanded the truth so that we can know what to do next. There’s a court case that has begun today requesting cabinet to constitute a board of doctors to determine whether the president is in good health or qualified to continue hold the position of president based on the report that is going to come from the doctors. Could you give us more information about this legal case which you’ve mentioned, about having doctors rule on the state of his health? Well, the constitution demands that if there is any suspicion that the condition of the president is suspect, anybody can demand through the appropriate channels – the courts of law – to direct that cabinet institute a board of doctors that is supposed to determine whether the president is actually fit to govern. One of the citizens from civil society has filed in the courts of law, in fact yesterday, demanding that the president’s health be checked by a board of doctors to inform the Zambian people as to whether the president is physically fit, mentally fit and emotionally fit to run the affairs of government. So we are going to wait for the ruling of the court and if the courts rule that the board be constituted, then the board is going to have to work on that assignment and give the Zambian people the position and the health of the president and then we’re going to pick up from that point. If he were ill why wouldn’t he receive treatment in Zambia? When he was in opposition, that is something he himself criticised former presidents that they needed to be getting medical attention from within the country. But obviously his condition, according to them, needed specialised treatment and they decided to take him out of the country each time he was unwell. I would like to see a situation where Zambia can take care of its president when the president is unwell just like all Zambians go to the medical facilities provided here in Zambia. And I think that President Sata should be comfortable with the treatment that he could receive from within the country. Posted on 12th July 2014 by newsafrica. This entry was posted in Africa, President Sata, Zambia and tagged Guy Scott, Israel, List of Presidents of Zambia, Michael Sata, Nevers Mumba, Vice President of the United States, Washington, Zambia. Bookmark the permalink. « Happy 80th birthday Wole Soyinka!